The story of today’s deficits starts in January 2001, as President Bill Clinton was leaving office. The Congressional Budget Office estimated then that the government would run an average annual surplus of more than $800 billion a year from 2009 to 2012. Today, the government is expected to run a $1.2 trillion annual deficit in those years. You can think of that roughly $2 trillion swing as coming from four broad categories: the business cycle, President George W. Bush’s policies, policies from the Bush years that are scheduled to expire but that Mr. Obama has chosen to extend, and new policies proposed by Mr. Obama. I remain an agnostic as to whether Obama’s economic policies will work, preferring to see the facts over time as opposed to falling into ideological certaintude, but I certainly do not buy the attacks from the right that Obama is responsible for bankrupting the country. Posted in Barack Obama, Bill Clinton, Economy, George Bush. Tags: Bill Clinton, Conservatives, Deficit, Health Care, Iraq, Medicare. RSS feed for comments on this post.. TrackBack URL. For how many years will Democrats have to have a majority in Congress before they will acknowledge having control of the purse strings? Considering how the federal government is structured, the Republicans remained the dominant party through 2008. Majority control of Congress does not really give a party control of the government as long as the other party holds the White House and over 40 seats in the Senate. 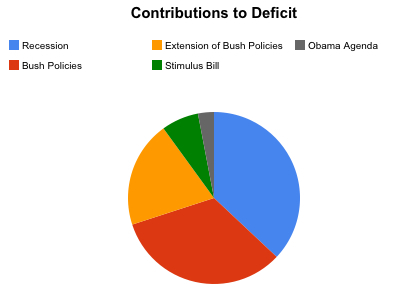 Bush’s policies dominated the budget even after the Democrats took control of Congress. All spending bills originate in the House. There is no filibuster in the House and the majority party pretty much rules. But they do need to be willing to take risks and, well, lead. The 24-hour news cycle must be wearing down our ability to comprehend time. On paper all spending bills originate in the House but in reality spending is largely driven by the Executive Branch. As b-psycho says, it has only been six months that the Democrats have really been in power. Considering how poor their record was, it is understandable that many Republicans like to push the meme that the Democrats have been in control longer than they really have, but why are you bothering to spread their ridiculous talking point on this? It just seems a little excessive to decide that the Republicans are in power unless the Democrats have the Presidency, the House, and 60+ votes in the Senate. Oh, and I suppose a majority of appointments to the Supreme Court also. If spending is largely driven by the Executive Branch, that is because Congress is failing their Constitutional obligations. Congress has certainly given up too much power to the Executive Branch. I did not say that the Republicans are in power ” unless the Democrats have the Presidency, the House, and 60+ votes in the Senate.” They are in effectively power when they have the Presidency and the Senate is split. Well, I think you need to have a little more faith in team Obama and just give him some time, i.e., it took GWB about 7 years to run up a deficit of $162 billion (1.2% of gross domestic product). For 2009, the budget deficit is projected to be 11 times larger: $1.752 trillion. This is due, again, mostly to GWB’s spending the (mis-)handle the financial crisis. However, it’s not over yet. The Congressional Budget Office released figures Friday forecasting that President Barack Obama’s budget will produce $9.3 trillion worth of red ink over 2010-2019 and that the deficit for this fiscal year will rise to a record $1.8 trillion. Right now, we’re in the red for 12.3% of current GDP. Let’s see — 9.3T is greater than 1.8T by about a factor of 5. Applying that factor to the current percent GDP deficits means 9.3T will be about 60% of current GDP. Well, the GDP is going to grow over the next 10 years, right? Right, but by how much? Team Obama predicts that U.S. GDP will increase significantly faster over the 10 years than over the last 10 years . . . that’s an incredible claim. Where is team Obama getting this prediction? Did they forget about this? The federal government is not alone in its fiscal troubles. The individual states face daunting fiscal prospects. Most European countries will experience significant fiscal deterioration over the next few years. Standard and Poor’s recently warned the United Kingdom that it could lose its triple-A credit rating on account of its projected debt-to-GDP ratio. The U.K. trajectory, however, is similar to that of several other countries, notably including the United States. In short, we’re gripped in one of the worse global financial and economic crises that any of us have ever seen, or will likely see again. Let us pray that team Obama somehow knows something that most experts don’t, that flies in the face of common sense, that would be a miracle if true. Let us re-convene here at this post every year — time will tell. If team Obama is wrong, the deficits over the next 10 years will blow all previous records way Way WAY out of the water. And now Congress is putting on a heavy energy tax. That should do some interesting things. Yes, this is definitely a huge step-up in big-government central planning to help create new energy markets (the rational being to help global warming). But it’s going to do just about zip for climate change (because it only applies to us, obviously). So, that’s the problem for team Obama and the Democrats: if it’s going to do almost nothing for climate change and at the same time raise energy prices immediately (in global recessionary and slow grow times by the way). Why add a provision which imposes stiff tariffs on our trading partners if they don’t adopt aggressive carbon restrictions of their own of course. Yup: progressives have authored a bill that raise the cost of domestic energy for all consumers PLUS! earns the mortal enmity of our most crucial trading partners at the same time — again, during a global recessionary and slow grow times. But progressives are pro-market, pro-growth, right? This is help both the economy and global warming, right? Well, not really: World Trade Organization rules make fairly clear that trade-limiting measures imposed to protect the environment should have the purpose of protecting the environment, and not to address any adverse competitiveness effects on domestic industry. Pray this stupid bill doesn’t pass the Senate. If it does, get ready for very slow economic growth for the next 10 years, after a recovery, and higher cost to run your A/C as the summers continue to get warmer. By the way, eight Republicans voted with Democrats to pass the bill; 44 House Democrats voted against it. Further, officials with the House GOP’s campaign arm, the National Republican Congressional Committee, confirm that they will run with paid media over recess in districts of conservative Dems who voted for the bill. The official would not reveal details on the ad buys at this time. One Democrat was upset that his leaders would needlessly force vulnerable Dems to vote for a bill that will come back to haunt them. Mississippi Rep. Gene Taylor (D) voted against the measure that he says will die in the Senate. “A lot of people walked the plank on a bill that will never become law,” Taylor told The Hill after the gavel came down. Let’s hope Taylor is correct about it dying in the Senate: It took the neo-cons about two years or so for their political self-destructiveness to shift into high gear (i.e., Iraq and spending). The new liberal team seems bound and determined to break that record.